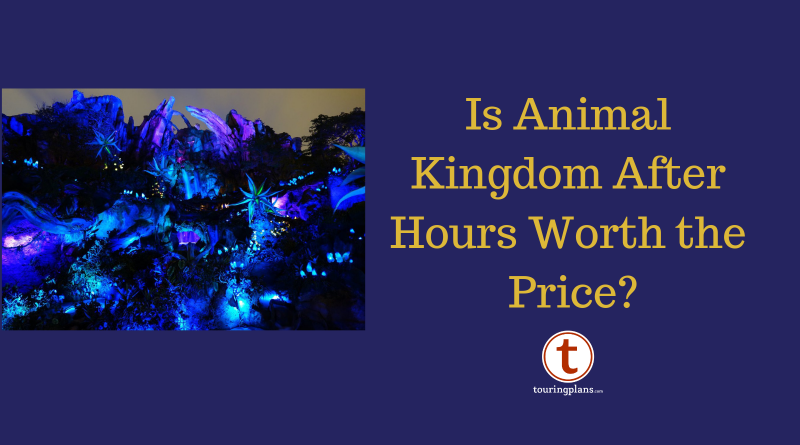 Disney After Hours at Animal Kingdom – Is It Worth the Money? In early 2016 Disney introduced Magic Kingdom After Hours, a late-night event for guests willing to spend the money for attractions with minimal to no waits. Laurel Stewart gave her positive review of the event in 2016. After poor sales of tickets in 2016, Disney revamped the event and relaunched After Hours in late 2018. The new After Hours event gives guests three hours of exclusive time in either Magic Kingdom, Disney’s Hollywood Studios, or Disney’s Animal Kingdom parks for $125 per guest ($129 per guest if purchased at the gate). 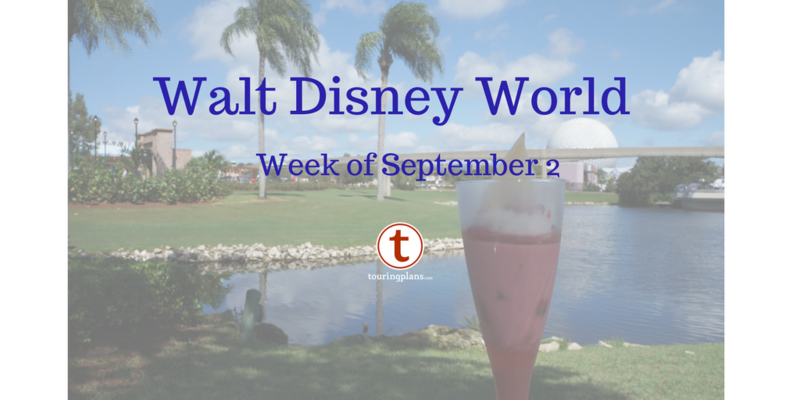 Guests can experience popular shows and attractions along with unlimited snacks and non-alcoholic drinks. Check in for the event starts at 7:00 p.m., at least an hour prior to park closing. With Pandora – World of Avatar the hottest ticket at Walt Disney World, I wondered if After Hours could be a good way to ride these attractions. Could this event work for those wishing to experience Star Wars Galaxy’s Edge when that opens in Fall 2019? Is After Hours a good way to tour Animal Kingdom instead of visiting during normal park hours? How many premium Mickey bars can I eat in three hours? To find answers (and see Pandora at night) I attended the Animal Kingdom After Hours event on February 5. What is Animal Kingdom After Hours? 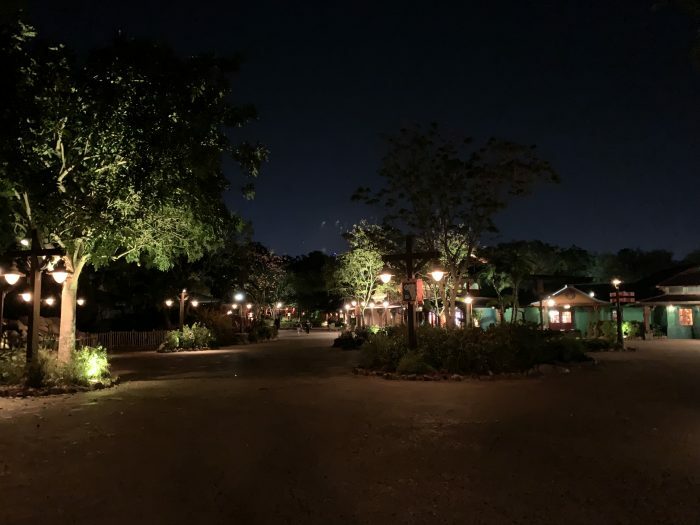 Animal Kingdom After Hours is a special ticketed event that provides a limited amount of guests access to the park after closing. 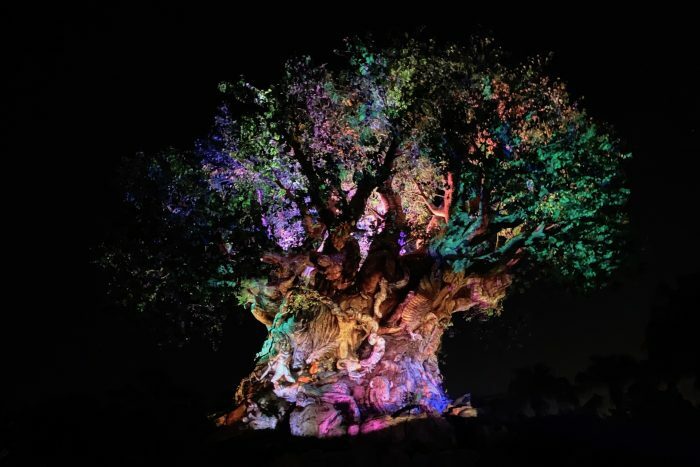 At Animal Kingdom, the event runs from 8:30 p.m. to 11:30 p.m. on select nights throughout winter and spring 2019. Check in starts at 7:00 p.m. and the park closes at 8:00 p.m., allowing guests to experience some experiences offered during normal operating hours. Select food items are available for purchase at Pongu Pongu, Thirsty River, and at several snack carts in Discovery Island and DinoLand U.S.A. Unlimited popcorn, ice cream novelties, and non-alcoholic bottled drinks are included in the price of admission and are located at snack carts in Asia, DinoLand U.S.A., and Discovery Island. If the unlimited ice cream has you in the shopping mood, then Island Mercantile, Windtraders, Serka Zong Bazaar, and The Dino Institute Shop are open. I arrived at Animal Kingdom at 7:00 p.m. and followed the Cast Members’ directions to the right-hand side entry points for After Hours guests. My first plan of attack was to experience the attractions that would close during After Hours–this would lead to my first disappointment. I love seeing animals at Animal Kingdom but by the time I was admitted for After Hours at 7:00 p.m. Kilimanjaro Safari and the animal exhibits were closed. I consider Kilimanjaro Safari one of the best attractions at Walt Disney World so it closing before we were admitted to the park is a huge disappointment. I chose to ride the one attraction operating but not featured during After Hours: Primeval Whirl. Despite my worries of lines the attraction had a five minute wait at 7:10 p.m.; Expedition Everest and Dinosaur featured similar waits. After Hours includes a special showing of Rivers of Light. I figured the light crowds on the rides would extend to Rivers at 8:15 p.m. I was right as we walked right to the edge of the river in the standby seating area. Rivers of Light concluded a little after the start of After Hours and the park was mine. If you squint you can see four other guests. If you have never experienced a sparsely populated park, it is exhilarating, haunting, and tiring. For a theme park fan it is like being a kid locked inside a toy store overnight. One gets to play with all the toys with no resistance but finds the push back was what made the toy store special to begin with; it is a monkey paw wish. It was spooky to walk pathways with no guests that on my last trip were shoulder-to-shoulder gridlock, I felt like I was getting away with a crime. 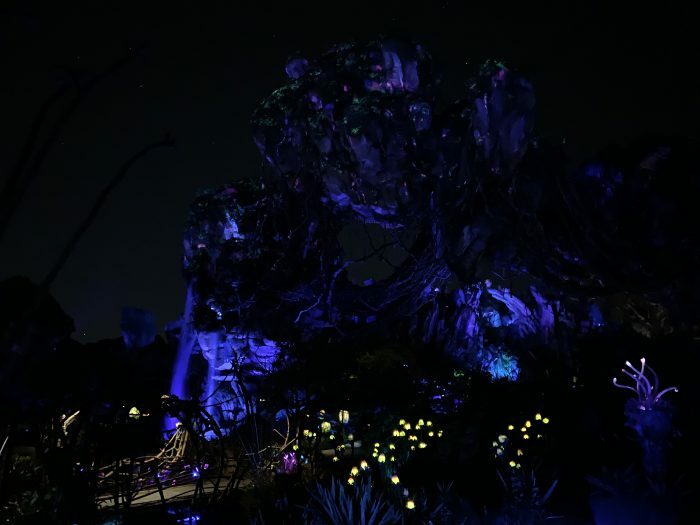 Disney sells After Hours as the premier way to experience Pandora with short waits and bioluminescent dreams. I bought my ticket to see Pandora at night and to ride Flight of Passage enough times to develop my opinion. 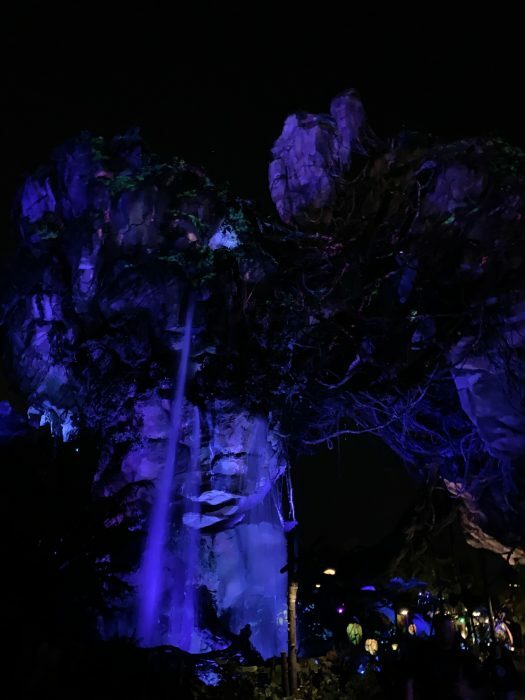 Pandora was empty at night, allowing me to capture amazing photographs of the glowing rockwork of the land. Both attractions sent guests through the FastPass lines to board but guests who ask Cast Member at load were allowed to explore the Flight of Passage queue more. 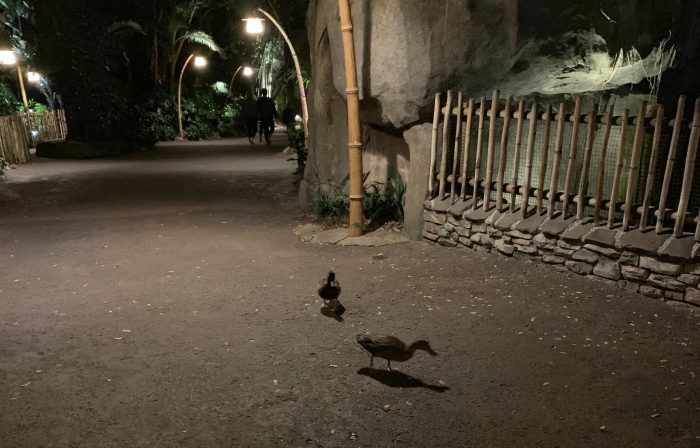 When I was bored with one ride I would walk to the next, frequently jumping between lands to refresh with bottled beverages and snacks in Discovery Island. When I got sick of Flight of Passage I headed over to Dinosaur. I rode Dinosaur twice, without having to leave my ride vehicle, then decided it was time to change my experience up a bit and ride Everest. After Everest I headed back to Pandora for more rides. After Hours features complimentary snacks and bottled drinks throughout the park, leading me to think it is some sort of Bacchanalia feast. In practice there was only one station across from Tiffins handing out free beverages and snacks during my visit. For $125 a person I would have expected Disney to feature a small cart at each major attraction with said free offerings plus some wandering Cast Members with bottled water and Coke products. By the end of the event at 11:30 p.m. I clocked in four rides on Everest, four rides on Dinosaur, five rides on Flight of Passage, and two rides on Na’vi River Journey to average out a ride every 12 minutes. The snack station across Tiffins closed about 15 minutes prior to the event and on my way out I received two boxes of “road popcorn”. Animal Kingdom ducks wished me safe travels and to return soon. At this point I was delirious, high off the rose water sprayed at me on Flight of Passage, and exhausted after riding more attractions in three hours than most guests do in a whole day. Was Animal Kingdom After Hours worth the $125 plus tax I spent? Yes, I believe it was. I rode many attractions and had a blast. If I went with someone else I likely would have loved it even more. But is After Hours a good event for everyone? Who is this Animal Kingdom After Hours For? Tree of Life at night between shows of Awakens. Fans of Avatar or who wish to see Pandora at their leisure will find this event is worth the money. Na’vi-heads can relax in Pandora, watch the drum show, experience the land at night, and ride the attractions with no waits. Guests with a taste for premium experiences (or an expense account) would also find the event worth their money. Pairing After Hours with a first seating dinner at a signature restaurant such as Jiko would make a lovely night with coworkers or friends. Finally guests with limited touring time and a park hopper pass could optimize their touring by park hopping to Animal Kingdom. Park hoppers could arrive prior to the close of the park to see the shows, trails, Kilimanjaro Safaris, and see the remaining attractions during After Hours or visit in the early morning and park hop to another park in the late morning. After Hours limits attendance so the usual touring tips like “arrive early” do not apply. Instead these tips are aimed to maximize your enjoyment of the park during the event and to avoid pitfalls unique to After Hours. Rest – After Hours runs until very late at night and I saw guests leaving prior to the end of the event from exhaustion. Arrival days spent relaxing or shopping would pair well with an After Hours night. Conversely pick an After Hours night where you can sleep in. Eat Prior to Coming to the Park – Yes, After Hours includes snacks but despite rumors to the contrary one cannot survive on Mickey Premium Bars alone. Have dinner prior to the start of the event. Not only will you have the energy to tour, but you will avoid the lines the purchase food. Start in Asia – Normally we’d suggest arriving prior to park opening and heading to Pandora first. With After Hours day guests are still in line for the attractions stand-by lines. Instead start in Asia with Expedition Everest and, if there is availability, Rivers of Light. Then once day guests exit Pandora head over to Na’vi River Journey and Flight of Passage. Take Breaks – My ride average of one attraction every 12 minutes can tire out anyone. Take breaks during the night by watching the Tree of Life Awakens, Pandora Drummers, or Rivers of Light. Resting will give you time to take in the atmosphere of the park, enjoy a free snack, and catch your breath. Have you attended Animal Kingdom After Hours? What did you think, and do you have any tips for touring? Leave your comments below. Avid amusement park and video game fan. Enjoys picking up rare beers at breweries, exploring cities, cooking, and leading the young men of his fraternity. Willing to bet the cost of a HS after hours ticket will be significantly higher than $125 starting this fall! I feel like the only case when this would be worth it is if I had a short trip and were paying ~$100 per park day anyway. Then I’m not paying that much more money and getting a lot done in very little time. As you said, this could be a good thing for an arrival day, though it probably means missing rope drop the next morning. So maybe this would be worth it if I’m in the area for some other reason (Universal??) and just wanted a one-day-one-park Disney fix. But even then, I don’t think AK is the park to do it. You lose a lot without the animals and the hands-down #1 stage show in all of WDW: Festival of the Lion King. (I’m sure “Nemo” was just a typo for you.) The Pandora drummer show is ok, but I feel like it’s probably a better experience with a decent crowd because the performers interact with and draw energy from the audience a lot. I’d probably rather do MK, where you can do a LOT with no lines, and without missing any particularly great shows. The only downside is that, even without lines, there’s SO much to do at MK, that you’d still have to prioritize a bit. So I think HS might be the best park for it. With so few rides there, many of which typically have ridiculous waits, you could really knock out that park in an evening and save yourself a day. The downside is that HS does have quite a few very good shows, but you’re not missing nearly as much as in AK. I’d expect that to be similar after SW:GE opens if everything else remains the same, though Disney will probably adjust things to make it less attractive (likely more $$). I’m not the biggest fan of Festival of the Lion King so I lapsed and went for Nemo. Ooops, I’ll edit it to add Lion King too. For me it feels like Disney sees a larger group of people going to UOR for HHN, Potter, or conventions and wants a piece of that pie too. Not a bad decision but hopefully it doesn’t affect operating hours for regular guests. My thoughts pretty much echo everything that @Tom said. I might only do this if I were visiting the area, on my own, for a reason other than Disney. The main issue I have with these events is the enormous cost for my family of 5. Paying upwards of $600 is simply an incredible amount to spend for doing the same things over and over and over for a few hours, even the things that we love. For a fraction of that cost, depending on our resort choice, we can add an entire day to our trip. And although of course Disney has the right to modify it’s business model by shortening park hours and phasing out offerings that were once perks for onsite guests, especially if people are willing to pay for them, it does rub me the wrong way. Not “worth it” for us. I only saw one family at After Hours, most of them were parties of young adults, older friends groups (shout out to the senior citizens on my Dinosaur vehicle who loved it and re-rode it), and couples in their 40s.